WINDERMERE — A five member crew from NBC News set up for a remote broadcast to viewers around the word Friday, Feb. 22 from the "Versailles" house in Windermere, which is poised to be the largest and most expensive mansion in America. This live shot utilized a small “sprinter” satellite truck, audio technician, camera operator and on-air talent from NBC News correspondent, Janet Shamlian. Keeping everything organized on location was Dan Shepherd, who has worked as a field producer for NBC News for over 14 years. 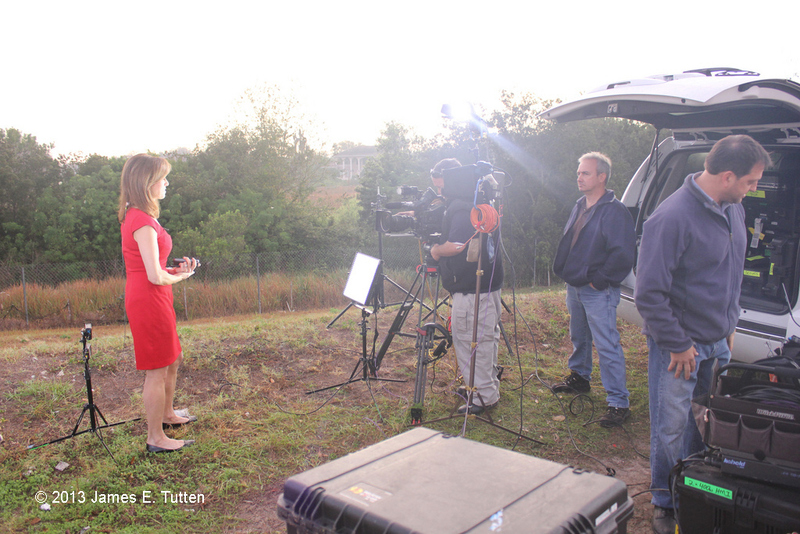 Crews like this are often sent all over the country and world to film wherever the news is happening. On this day, the Today Show was broadcasting from Miami and show producers wanted to profile stories of interest in the same region. This is what lead them to the "Versailles" mansion in Windermere, a 90,000-square-foot home that has been been under construction for nearly nine years. Along the way it has faced foreclosure, been the subject of the movie and is still around three years from being completed with a final estimated market value of $100 million. Members of the NBC crew along with correspondent Shamlian, spent the day before this live shot interviewing homeowners David and Jackie Siegel, touring their current mansion in Windermere and the Versailles property. The couple spoke about being inspired to build this mansion after visiting the Palace of Versailles in France, and also reacted to the film that documented their struggle to undertake such an ambitious project amidst the economic downturn and housing market crash that began in 2008. There was word from show producers in New York that the segment may be delayed as the broadcast time of 7:45 a.m. neared, due to recent developments in the alleged murder case of London Olympian and Paralympic runner Oscar Pistorius. Shepherd kept in nearly constant contact with other producers to ensure that everything was still running as planned before the live broadcast began. Then the moment came when Today Show host, Savannah Guthrie, segued into the story on the Versailles home, and Shamlian read through her prepared statements and the edited video report was aired to viewers around the world. One rare and unforeseen technical error did occur from the control room in New York, with a delay in the audio in Shamlian’s earpiece. Also when on-air talent pulls out their earpiece it is a non-verbal signal to everyone on location and in the control room that there is a problem so they can work to fix it. Despite this distraction, Shamlian maintained her composure and performed her segment without skipping a beat. Shamlian is a seasoned journalist who has covered many big stories while working with NBC for the past seven years, and while previously working for several years with local television news stations around the nation.